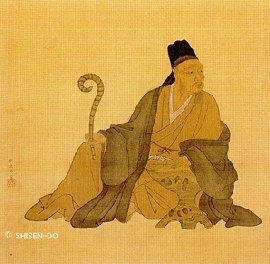 Shisendoo 詩仙堂 Shisen-do "Hall of the Great Poets"
. WKD : Joozan Ki 丈山忌 Jozan Memorial Day . 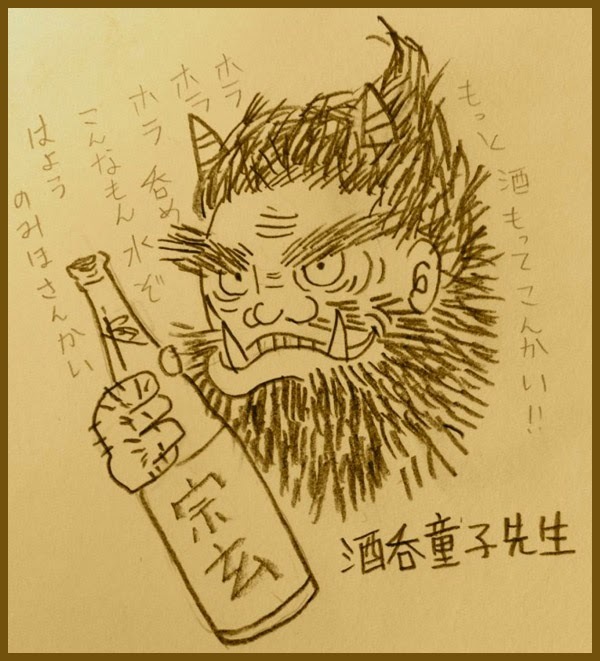 Jozan had worked for Tokugawa Ieyasu and distinguished himself during the Summer Battle of Oasaka 大坂夏の陣. Inside in a special room are paintings of the 37 Immortal Chinese poets. 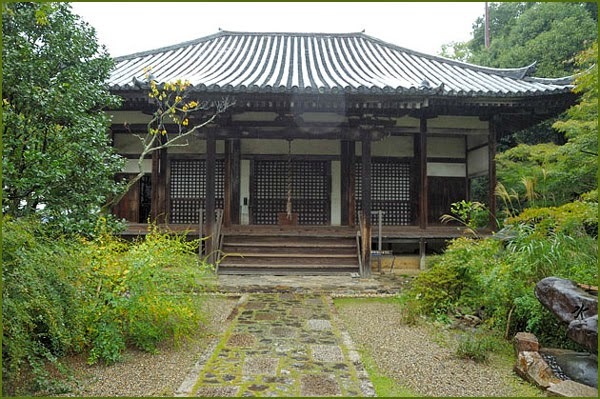 Basho had stayed at Shisen-Do 詩仙堂 Shizen-Do hall with Sora and Kyorai. This is a small hermitage which Ishiyama Joozan 石山丈山 Jozan had build in Ichijooji 一乗寺 Ichijo-Ji, a district in Sakyo, 左京 Kyoto.
. WKD : haori　羽織　Haori coat and Basho .
. WKD : kaze kaoru　風薫 fragrant (summer) breeze .
. Masaoka Shiki visiting temples and shrines . . . sennin 仙人 immortals, mountain hermits, poets . 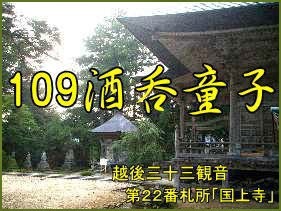 Another famous temple of this district with a "Basho-An" in his memory. Kuwana was a famous castle town of the Matsudaira clan. 松平十一万石. The temple Honto-Ji belongs to the Shinshuu Otani-ha sect of Buddhism 真宗大谷派, 浄土真宗. 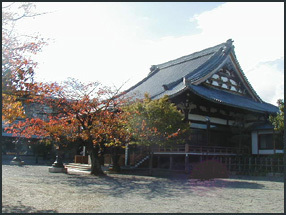 It is a affiliated temple to the Higashi Honganji in Kyoto 東本願寺別院. Kuwana Betsu-In 桑名別院. 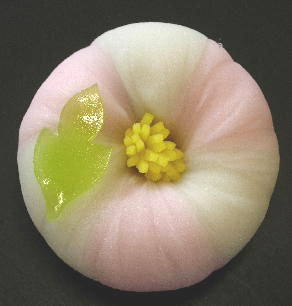 It is also called Kuwana O-boo 桑名御坊. 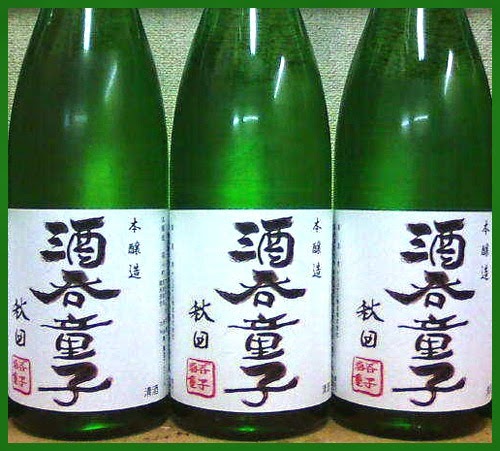 Ootani Takue or Takkei 大谷琢恵 Otani Taku-E, haikai name Koeki, Ko-Eki 古益. 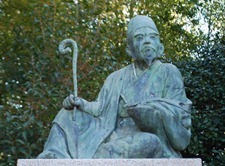 Ko-Eki was also a haikai student of Kitamura Kigin 北村季吟 and thus a "haikai brother" of Basho. They had a haikai party with other poets. was the forty-second of the fifty-three stations of the Tōkaidō. It is located in former Ise Province in what is now part of the city of Kuwana, in Mie Prefecture, Japan. It was located on the western shores of the Ibi River 揖斐川 and is considered to be the eastern most point of the Kansai dialect. It is 28 km from the preceding post station of Miya-juku. Kuwana-juku was located in the castle town of the Kuwana Domain. It is connected to Miya-juku through the Pass of 28 km (七里の渡し, Shichiri no Watashi) and served as the entrance for those going towards Ise Grand Shrines. 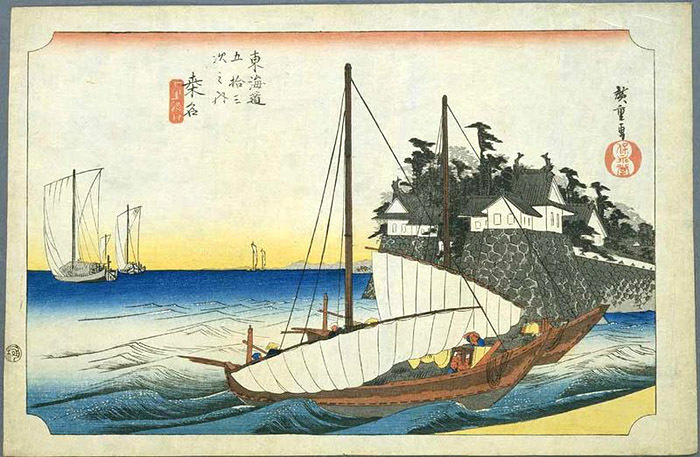 Some travelers along the road would take ships across the inner Ise Bay from Miya-juku (located in present-day Nagoya near Atsuta Shrine) to Kuwana, thus avoiding numerous river crossings. The classic ukiyoe print by Ando Hiroshige (Hoeido edition) from 1831-1834 depicts the tow large ships moored in the Kiso River, with other ships sailing away in the background. 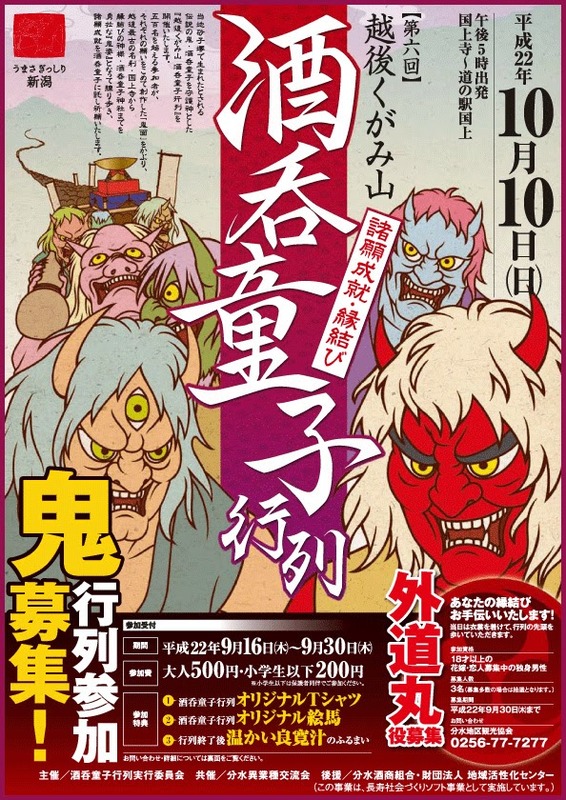 At the end of the Edo period, Kuwana-juku had two honjin, four wakihonjin and 120 lesser inns. During the Edo period, Kuwana was directly on the shores of the river, but after the Kansai Railroad built Kuwana Station, the city center was shifted further to the west.
. Tokaido 東海道五十三次 - 42. Kuwana-juku 桑名宿 (Kuwana) .
. WKD : Kuwana matsuri 桑名祭 Kuwana Festival . 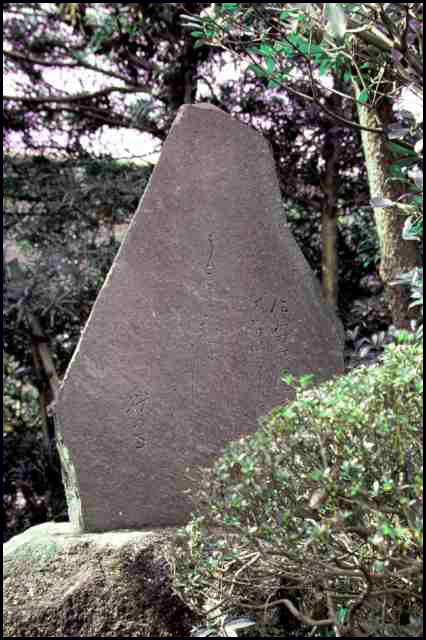 The original memorial stone of the Edo period had been lost, this is a replica from 1937. A cuckoo in the snow! 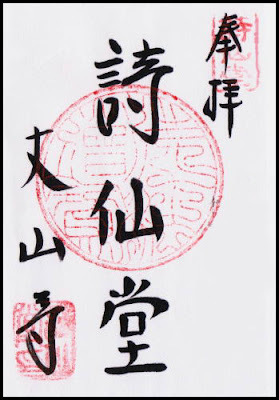 This very special haiku by Basho contains four kigo!
. WKD : fuyu botan, fuyubotan 冬牡丹 winter peony . kan botan 寒牡丹 "peony botan in the cold"
They usually blossom in early summer, but their buds are taken off to make them flower in winter. They get a little straw cover to keep out the severe cold. Murō-ji is a temple of Omoto school of Shingon Buddhism, located in the city of Uda, Nara, Japan. 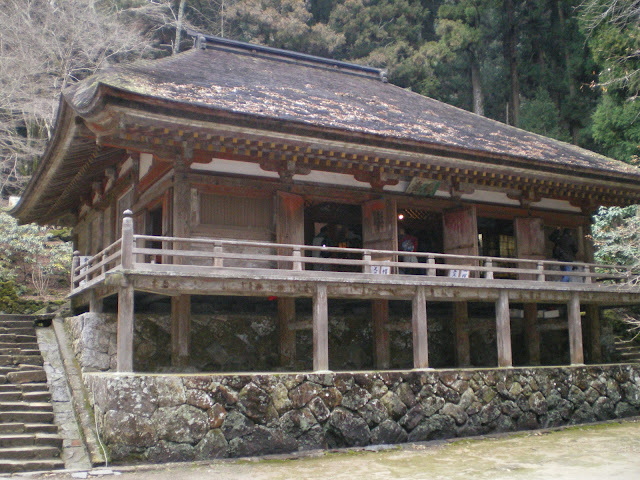 Murō-ji shows its typical aspect of Shingon Buddhism, with its buildings laid on the mountainside of Mount Murō (室生山, Murō-yama). 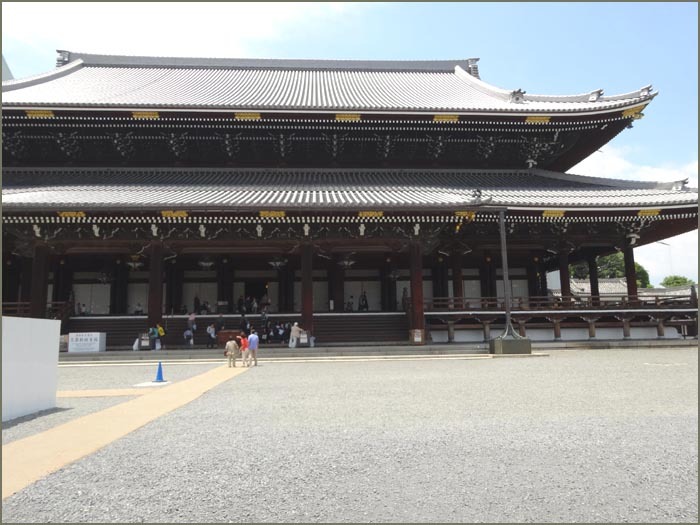 Unlike many temples of the time, Murō-ji was opened to females. 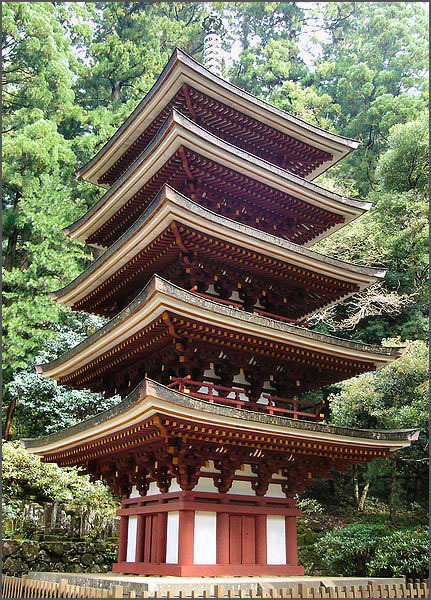 For that reason, the temple is also called Mount Kōya for women. 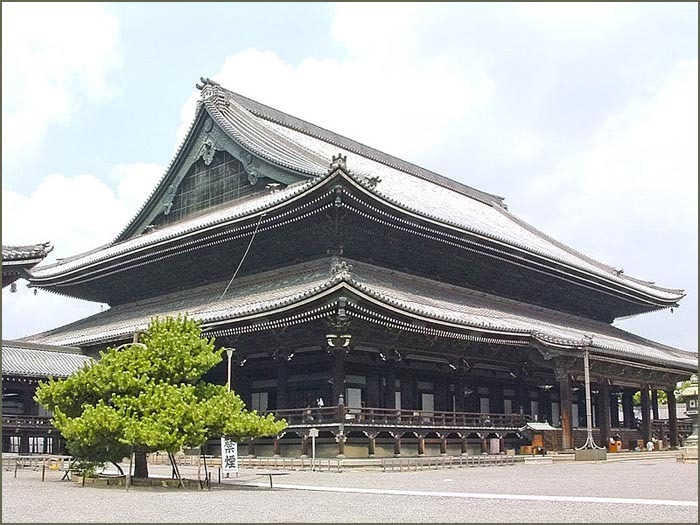 While legend has it that the temple was opened by En no Gyōja by order of Emperor Temmu, later restored by Kūkai, an extant record kept by the temple, Murō-ji ryaku engi (室生寺略縁起), tells that a successful ritual in respect of a ryūjin to cure Prince Yamabe's (later to become Emperor Kammu made the imperial court order a monk of Kōfuku-ji named Kenkyō (賢璟) to construct a temple on the site. 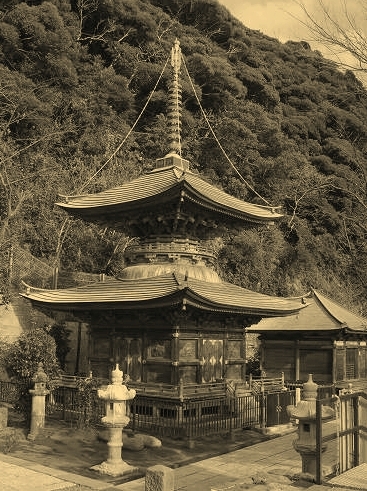 The construction of the temple was taken over by a pupil monk Shūen (修円), after Kenkyō's death in 793. Among the buildings that remain from the ninth century is the five-storied pagoda, which is the smallest of the kind standing in the open air. 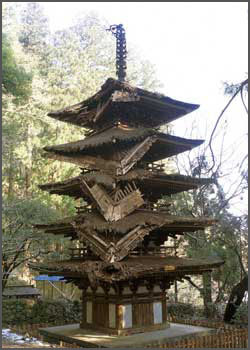 The pagoda suffered major damage in a 1998 typhoon, when a falling tree struck it. It was restored over the following two years. 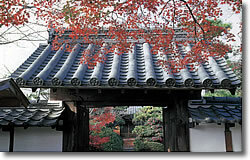 In Edo period, the temple buildings were repaired by donation of Keishō-in, mother of Tokugawa Tsunayoshi. 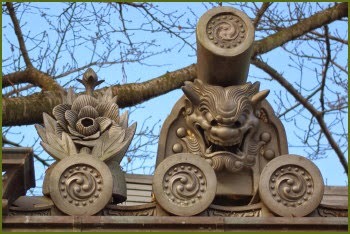 About a kilometer east of the temple is located Ryūketsu Shrine, enshrining the ryūjin (Dragon Deity). Muroji (or Murouji / Murou-ji) temple is one of Nara's best temples, an absolute gem. Yet due to its location it is one that very few foreign visitors to Nara have the opportunity to see. If you have the chance to visit - grasp it! Located in Murou village in the Uda district of Nara Prefecture. 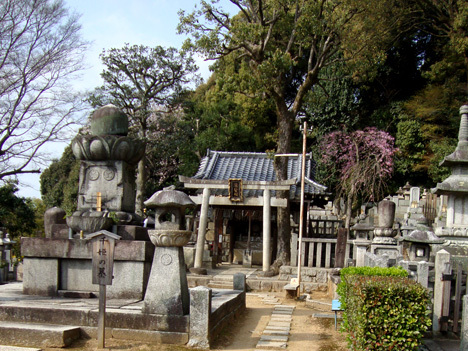 Constructed in the Enryaku era (780 - 805), Muroji stands in a mountain valley, buried in the midst of large cryptomeria groves. 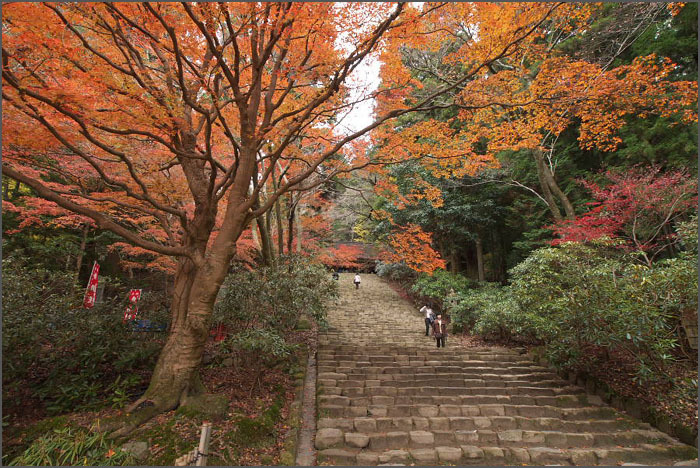 Depending on the season, the Kondo (Main Hall) which stands at the top of Muroji's long stone stairway presents the visitor with a variety of elegant and graceful expressions, set against a backdrop of vivid greens in spring and summer, or blazing reds and yellows in autumn. 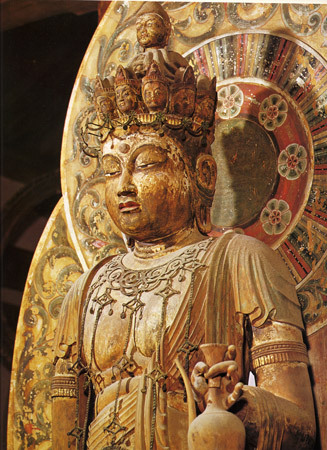 The Mirokudo Hall houses such works as the seated Shaka Nyorai figure, an absolute masterpiece exemplifying the distinctive flavor of early 9th-century Buddhist art. Instead of bronze statues that were common in the Asuka and Nara period, the statues in Muro-ji were carved beuatifully from wood. 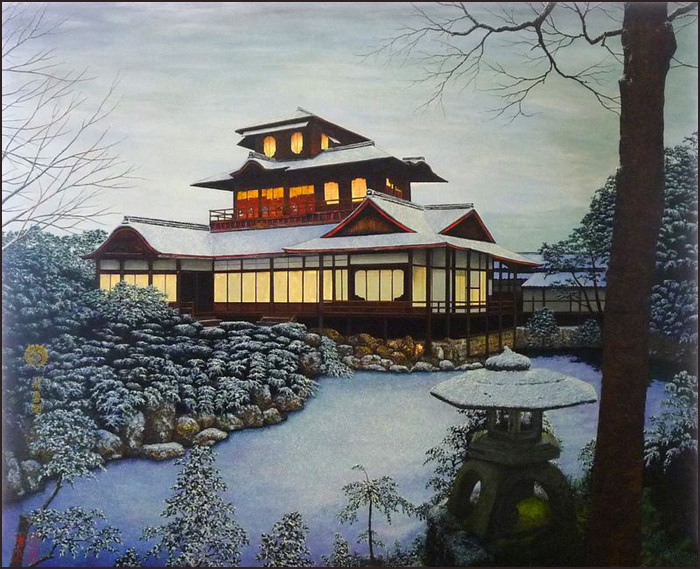 The early Heian Period marked an era in which temples relocated into the mountains from the plains. There is also evidence that the architecture was beginning to return to a more traditional style of construction. 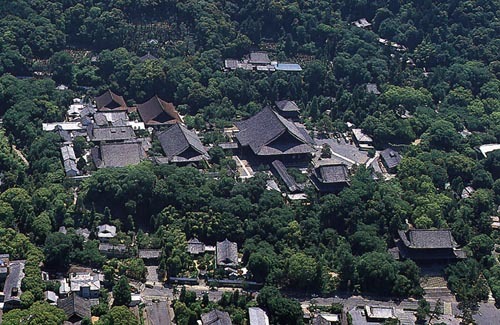 Lack of open spaces compared to the Asuka and Nara periods not only discouraged large symmetrical plans, but also made the buildings themselves smaller. Muroji exhibits a main hall that is decidedly smaller in scale compared to anything from the previous eras. It is believed that the original structure was even smaller because the enclosed porch appears to be a later addition. 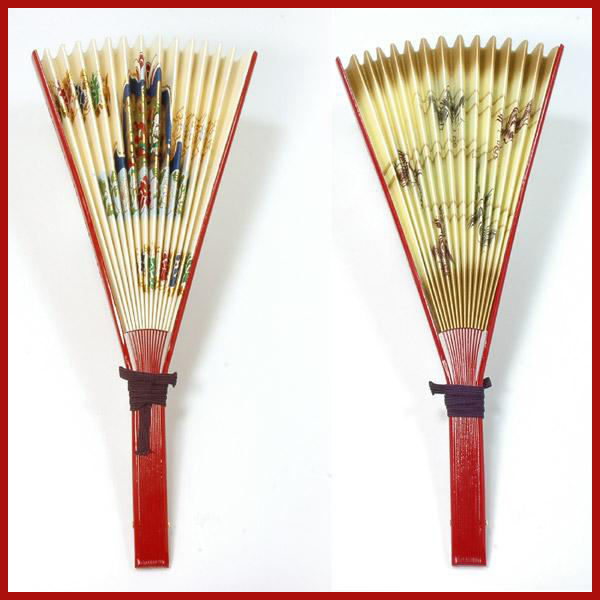 The pagoda itself is of a smaller scale yet is perfecct in its proportions. The base is a slender eight feet by eight feet square, and a mere 43 feet high. 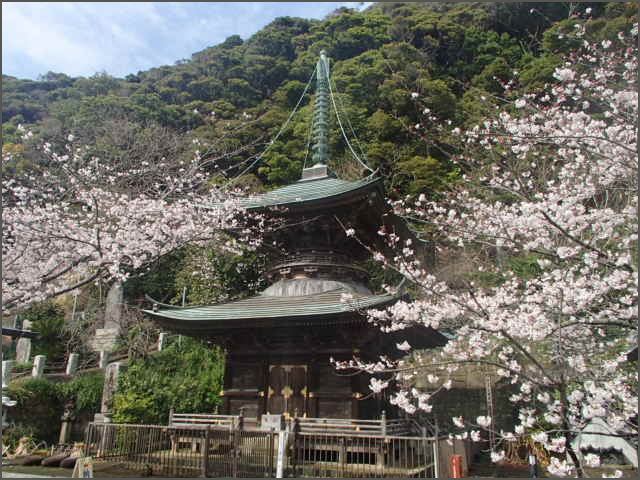 In the flower season of April, this temple has many blooming rhododendrons. The unique atmosphere of the "Female Koya" - brings many visitors, especially in May, when rhododendrons are in full bloom. Another popular season is in October and November, when the autumn leaves of the enormous and beautiful canopy overhead start changing color. In this season Muroji is uncommonly beautiful. He spent a few days at the foot of the mountain, to wait for the right situation to take the famous photo of late snow on the pagoda. ... He is one of the most renowned Japanese photographers of the 20th century. He is most celebrated as a photojournalist, though he may have been most prolific as a photographer of Buddhist temples and statuary. 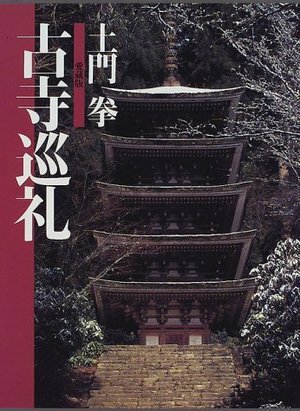 In 1984 he published Nyonin Kōya Muroji 女人高野室生寺.
. Hosomi Ayako 細見綾子 . of temple Muro-Ji . . . This haiku has a pleasant repetition of the sound NO. I try to imitate this with OF.
. WKD : "rain on the green", ryoku-u 緑雨（りょくう） . 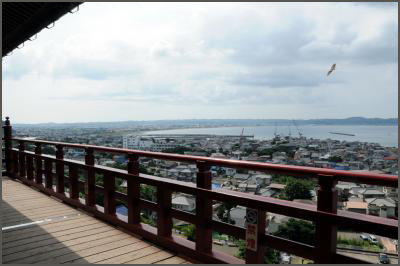 After the destruction of the typhoon in 1998, the pagoda was build again. Yatabe san from Ibaraki is a carpenter himself, and I suspect he was involved in the reconstruction together with many other carpenters.
. WKD : choona 手斧 carpenter's ax . 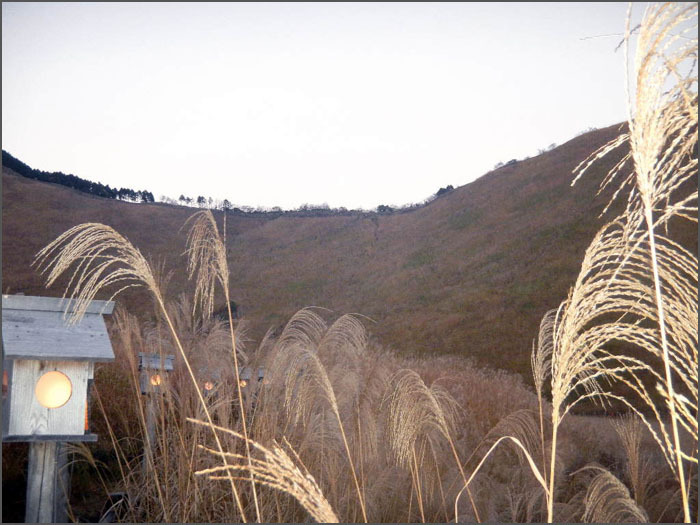 Look at an image from an ax ritual of the New Year.
. Takano Sujuu 高野素十 Takano Suju .
. WKD : Pampas grass (susuki 薄 , obana) . located in the city of Tateyama in southern Chiba Prefecture, Japan. The temple is also called "Nago-ji" using the alternate pronunciation of the final Chinese character in its name, or the "Nago Kannon" (那古観音), after its primary object of worship. Nago-dera is located on the middle slopes of Mount Nago at the southern tip of the Bōsō Peninsula, and is surrounded by forest. 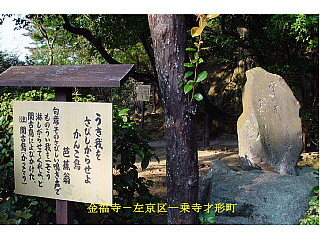 The area around the temple has important stands of sudajii Castanopsis, the tabunoki machilus species of laurel, the yabunikkei species of cinnamomum, camellia and the himeyuzuri species of daphniphyllum. 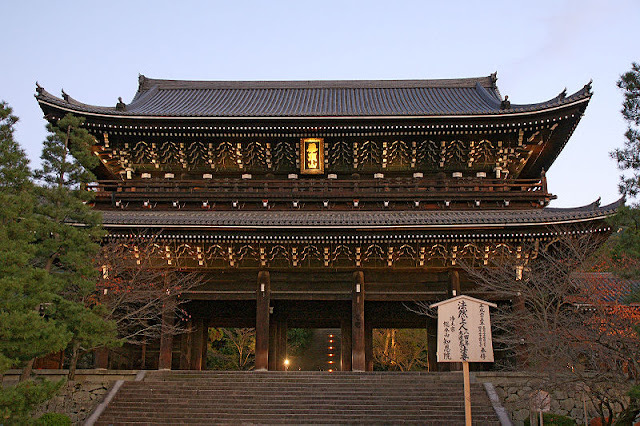 According to temple legend contained in the Nago-dera engi text, Nago-dera was founded by the wandering holy ascetic Gyōki around 717 AD to pray for the recovery of Empress Genshō from an illness. However, no historical documents have survived to substantiate this legend, and the history of the temple is thus uncertain. Most of the temple was destroyed by a fire in 1703, and its oldest existing structures are its Hondō (本堂) main hall (1759) and Tahōtō (多宝塔) pagoda (1761), both of which are registered as Chiba Prefectural Important Cultural Properties. Nago-dera was used as a place of worship by successive samurai and clans, starting with Minamoto Yoritomo (1147 – 1199), Ashikaga Takauji (1305 - 1358), Yoshizane Satomi (1412 – 1488) and members of the Tokugawa clan. 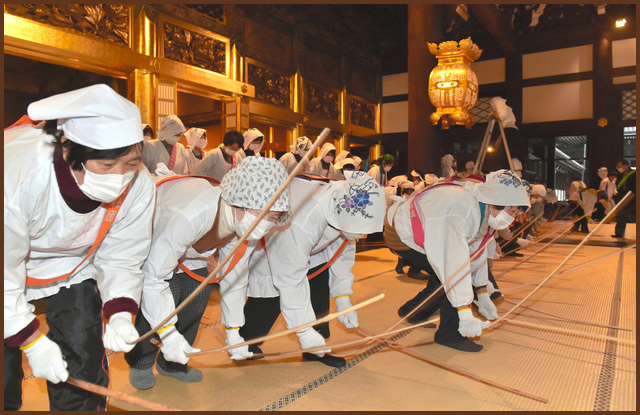 The temple currently belongs to the Shingon Chizan Sect of Japanese Buddhism. 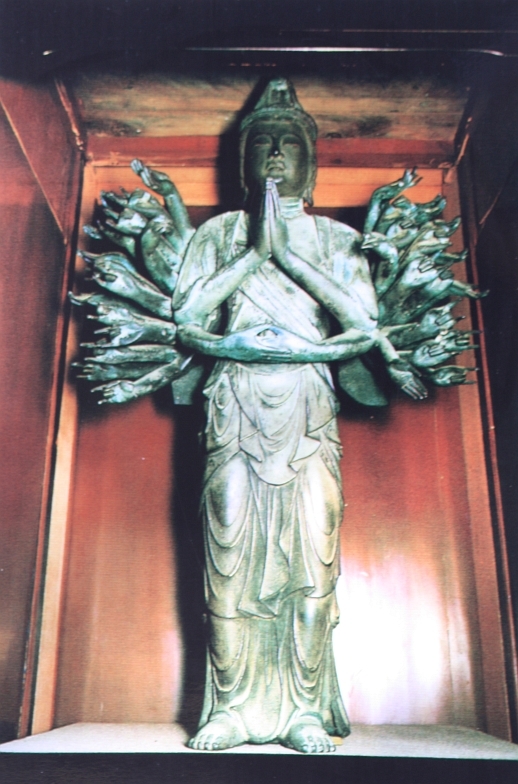 Its Gohonzon (primary object of veneration) is a bronze statue of Senju Kannon Bosatsu (千手観世音菩薩, Senju Kanseion Bosatsu),which dates from the Kamakura period. 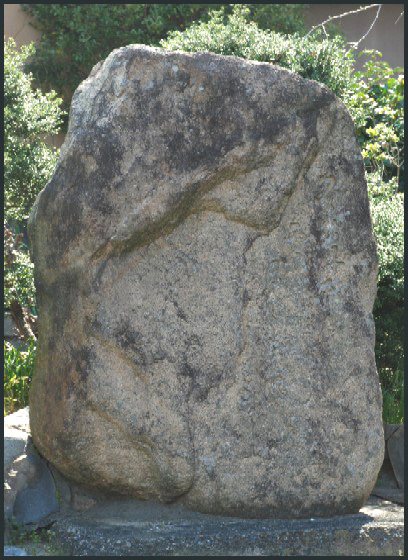 This statue is a national Important Cultural Property. This temple is Nr. 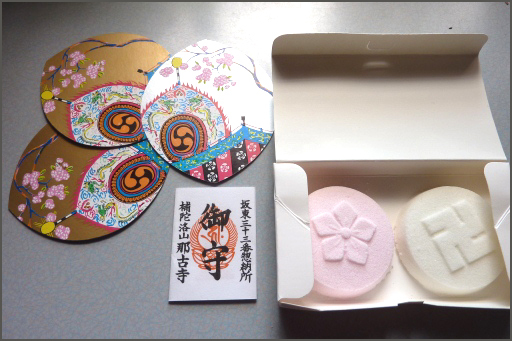 33 on the pilgrimage to 33 Kannon temples in the Kanto region. 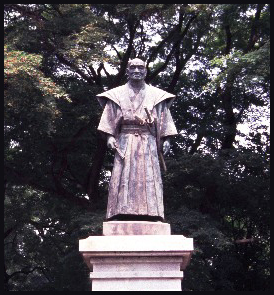 Haiku poet of the Taisho and Meiji period. down to the sea . . .